Hard, compacted soil often results from walking on soil after it has been tilled, but before it has dried. Although nearly any soil will compact under weight, soils high in clay particles are more susceptible to compacting, partially due to the soil's poor drainage and partially due to the small particles in the soil. Remedying the situation requires both physical manipulation of the soil and the addition of soil amendments to improve aeration and drainage. Tilling the soil is the first step to loosening hard soil. Till or plow the soil to a depth of 10 to 12 inches when the soil is dry. 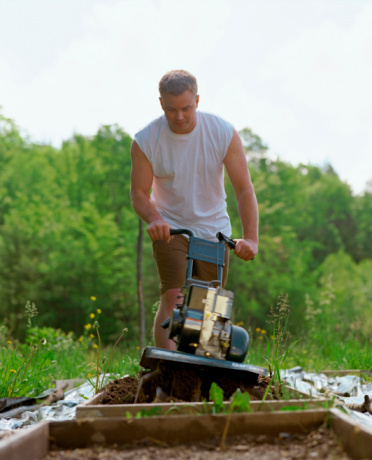 Severely compacted soil may require a plow, but most can be tilled with a garden tiller. Till the area in a back and forth motion in one direction until the entire area is tilled. Repeat the procedure by tilling in the opposite direction. Allow the soil to dry before walking on it or adding amendments. A sunny afternoon or two typically dries the soil, but the time required depends on the weather and your specific soil's composition and moisture content. Break up any clods of soil with a garden hoe or spade. Remove rocks, roots and debris from the area. Rake the area smooth. Place a 3- to 4-inch layer of organic matter over the soil. Peat moss works well, but may be cost prohibitive in large areas. Compost or well-rotted manure both add organic matter and are ideal for garden plots. Work the organic matter into the soil with a garden tiller. Organic matter increases aeration and promotes good drainage reducing the risk of compaction.